Which Version of TurboTax Do You Need? Nothing to install, complete your return online. Start for FREE, pay when you file. $0 Fed. $0 State. $0 File. 1 federal e-file. State additional. Install on Windows or Mac. E-file up to 5 federal returns. 5 federal e-files. State additional. 5 federal e-files. 1 state download $10 extra. 5 federal e-files. 1 state download included. 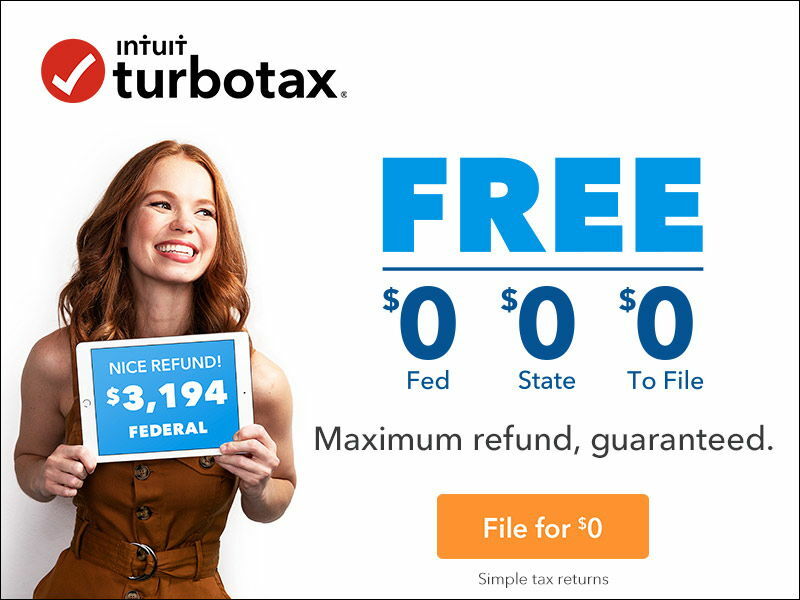 Save on TurboTax 2018-2019. Use the chart below to compare prices and features. TurboTax 2018 is the current version of TurboTax for filing your 2018 tax return, due April 15, 2019. Active Military: Thank you for your service! Get the TurboTax military discount here. Current Student: Check here for the TurboTax student discount. TurboTax 2018 is fully compatible with Windows 7, Windows 8, Windows 8.1, Windows 10, and Mac OS X 10.11 or later. The current best deals on TurboTax 2018-2019 are shown in the table below. New: Expand the chart to see more detailed features by clicking each category. * All TurboTax Desktop products include the same forms, however, the amount of guidance provided to complete the forms varies depending on the version. Price for TurboTax Basic does not include a state return. TurboTax Deluxe may be purchased with or without a state return included. The price currently displayed does not include a state return. If purchased with a state return included, TurboTax Deluxe is approximately $10 more than the price displayed in the table. Who should use TurboTax Business? TurboTax Business is for filing small business tax returns, including C and S corporations, partnerships, estates, trusts, and multi-member LLCs. Single member LLCs that have elected to file as a C or S corporation can also use TurboTax Business. Sole proprietors and single-member LLCs that have not elected to be taxed as a C or S corporation should use TurboTax Home & Business instead since they are taxed as a disregarded entity on the owner’s federal tax return using Schedule C.
Supports Forms 1065 (Partnerships), 1120 (C Corp), 1120S (S Corp), 1041 (Estates & Trusts) and the additional forms that go with them, including Schedule K-1, Form 1096, 1099-Misc, W-2, and W-3. TurboTax is a software package published by Intuit for preparing federal and state income tax returns. It makes it easy for normal everyday people to prepare their own tax returns by following a step-by-step question-based guide. In addition to filing tax returns, TurboTax can help those who are self-employed or running small businesses make estimated quarterly tax payments and create W-2s or 1099s for their employees and contractors. New TurboTax versions are released at the end of each year and only work for filing tax returns for that year. Most versions of TurboTax include federal tax return preparation and free e-file. Many versions also include a state tax return preparation, but the state e-file is usually an extra fee. Users who don’t want to pay the extra state return filing fee can print and mail their state return at no additional charge. There are five main versions of TurboTax: Basic, Deluxe, Premier, Home & Business, and Business. The comparison chart above shows the major features of each version, along with a price comparison of several online retailers. There are two ways to use TurboTax to do your taxes. You can use the online version or the desktop version. Both versions will allow you to prepare your taxes, but there are some differences, including the price. This article explains the differences between the two products. For most users who need to file a state return in addition to the federal return, we recommend the desktop edition, which is the edition discussed on this page and in the above comparison chart. The overall cost is typically lower for the desktop edition, after taking into account any filing fees or extra preparation fees.